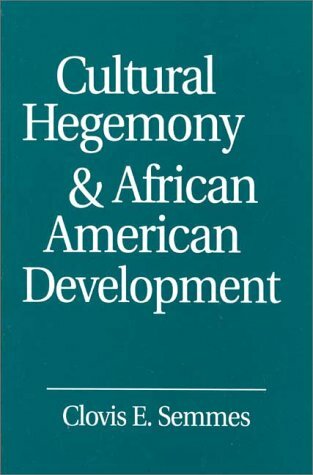 between cultural hegemony and the African American experience and establishes how this relationship creates distinctive and recurring problems for development. The following two chapters analyze the works by sociologists E. Franklin Frazier and Harold Cruse. Chapter 4 explores the role of legitimacy in psychological and social psychological adaptation, and inter- and intra-group relations. In Chapter 5, Semmes analyzes the relationship between the political economy of the mass media and African American aesthetic and artistic production, and argues that the expropriation of African American cultural products is a structural problem contributing to cultural negation. Chapters 6 and 7 examine two important institutional forms: religion and health. Next Semmes looks at the significance of cultural revitalization efforts which reveal the collectively-felt need to transcend destructive hegemony. He concludes with a chapter on factors affecting the production of knowledge in African American studies and the implications for cultural development. Sociologists and scholars in Ethnic and American Studies, as well as African American Studies, will find this study useful.